It follows the trade association commissioning a new independent report by Oakdene Hollins — which has already compiled two previous reports in 2014 and 2016 — into mattress recycling and the fate of end-of-life products. "We are asking as many retailers and manufacturers as we can to participate in the survey so our data base can be as comprehensive and accurate as possible," said Jessica Alexander, NBF executive director. "The better the data input, the more rigorous the report’s findings and the better our future policy planning can be." 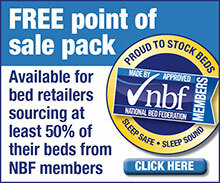 Previous reports have aided the NBF's understanding of the scale of the issues presenting by mattress disposal and supported its aim of cutting waste and improving recycling rates.